It’s not everyday you hear Beirut referred to as “paradise”, but today’s local street artists indeed see it as just that: a paradise for street art. In fact, the whole country is full of empty concrete spaces and barren, unpainted buildings calling out for color, plus authorities don’t usually seem to mind (with some known to have even joined in on the painting), so artists can work in broad daylight in populated areas where their work can be seen by large crowds. 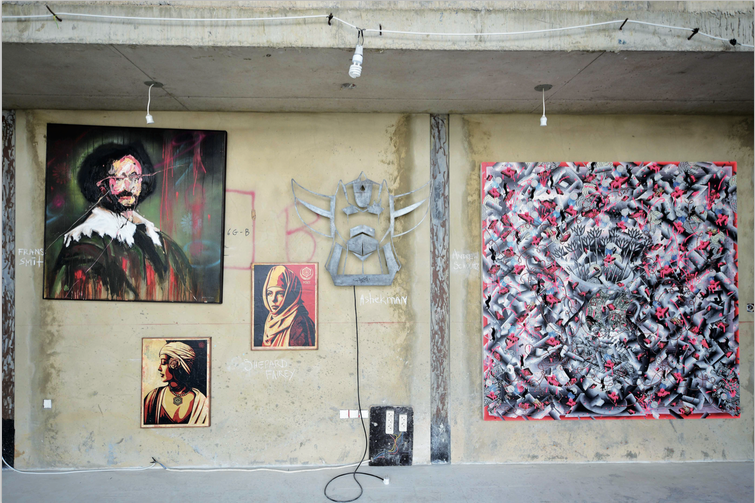 Local artists say their foreign counterparts are impressed with Lebanon’s potential, and many of them have left their beautiful marks on the country’s concrete. Street art today is continuously evolving and moving into new creative directions, far from the inner-city vandals of the 70s and 80s in New York who tagged names on as many walls as possible to mark territory. As street art increasingly becomes a legitimate artform, graffiti artists are shifting their styles, mediums and platforms to change the environment around them. Like in any artform, individual artists develop styles and signatures, but overall patterns emerge among artists from one part of the world. 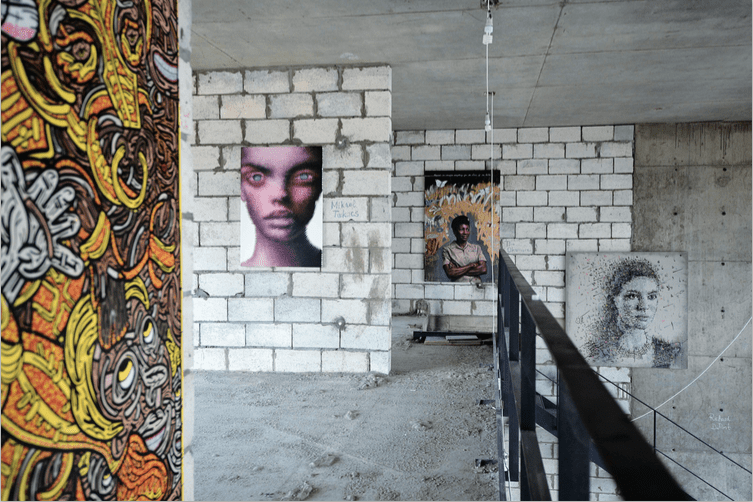 Lebanon’s street art scene didn’t start to get attention until the early 2000s, a few decades after the US and Europe, so its style isn’t that distinct just yet. George Khoury, whose graffiti you’ve probably seen signed around town as Phat2, points out one thing that distinguishes Lebanon’s collective street art style is the tendency to do daylight painting, as opposed to artists in other countries who often paint at night to avoid getting caught. Working under the bright light of day is easier and results in some truly creative masterpieces. Another local distinction is the use of Arabic, which has also evolved into the widespread use of calligraffiti. The Ashekman twins Omar and Mohammed Kabbani say their signature is to always use Arabic. They began as a rap duo in the early 2000s, so graffiti was a natural next step to spread their name around town. With time, they evolved and integrated social and political messages into their work but the one constant has always been Arabic. Meanwhile, Yazan Halwani (fun fact: he’s the Kabbanis’ cousin) is a self-taught Arabic calligrapher. Very philosophical in his approach to his art, he realized early on that Western-style graffiti was “at a complete disconnect with the history of Lebanon and the art history of the region.” Researching the visual elements of local culture brought him to calligraphy, though his style is a strong shift from the dogmatic rules of the traditional practice. He stopped using words in his art years ago, and today uses Arabic letters as pixels – something inspired by his degree in computer engineering. 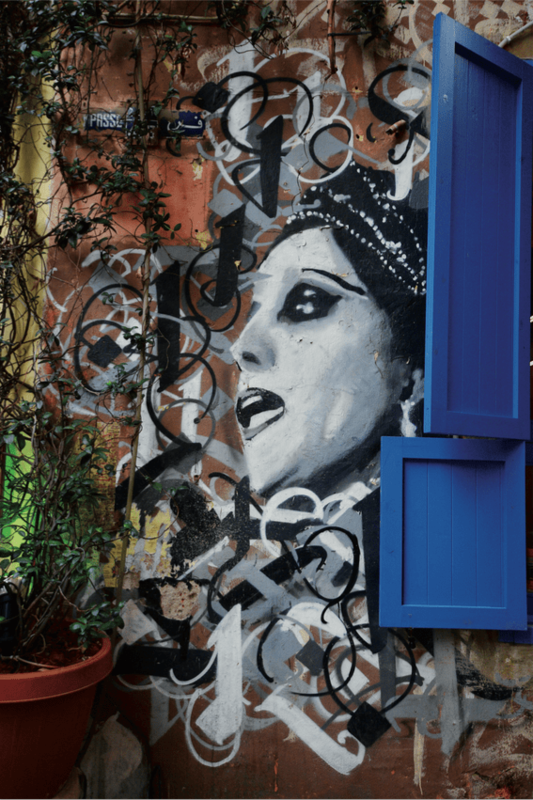 “You can express meaning without writing anything, just with the letters,” he says, which is why when you look at the face of Sabah in his mural on Hamra street, it looks like there are musical notes floating around her. Painting portraits of famous Arab figures is another local trend. Yazan says his reason for doing this is a counter-reaction to political posters splattered all over Beirut, especially around elections. But famous humans aren’t the only portraits on Beirut streets. Many artists around the world chose to paint characters that become part of their signature style. For Ashekman this has been the action hero Grendizer as well as The Muppets characters – including the famous Kermit that greets you at the entrance of Achrafieh. Alfred Badr signs his work as EpS, but he’s probably even more recognized for his crowned monkey character, which he’s now taken onto canvases too. As part of the exhibition, several artists from various countries including Russia’s Ntook, the US’s Andrew Schoultz and Brazil’s Finok and Ethos created masterpiece murals in Beirut. Nasser says he wanted to paint the city in the hopes of unifying and beautifying different parts of town, noting that Lebanon’s public has been increasingly appreciative of all forms of art over the past decade. 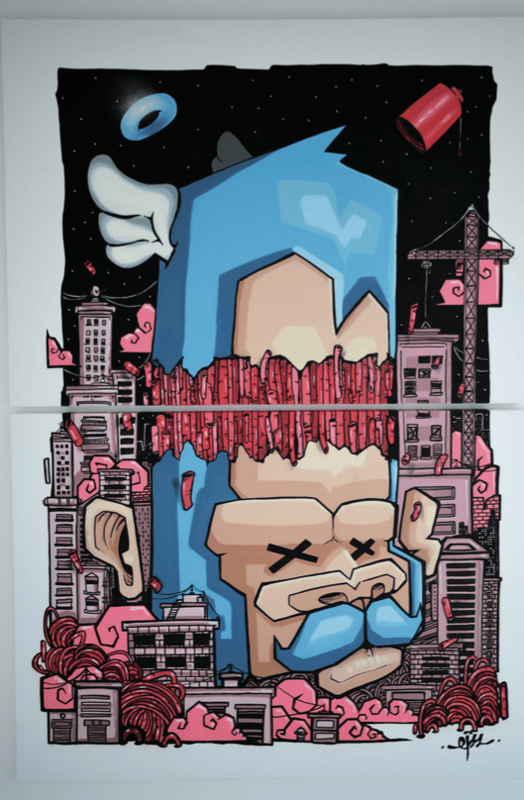 “Beirut’s street art scene, although still in its early days, has witnessed a growth in popularity through social media and the fame acquired by a couple of very talented Lebanese graffiti artists,” he says. Such initiatives encourage the art further, and teach locals new practices. In 2012, as part of the White Wall event organized by the Beirut Art Center, Elie Zaarour, known in the steet art world as Zed, worked with Chile’s Inti on the giant mural of a strange creature with a goat at the end of Hamra Street. EpS says international artists love to work here because they enjoy the relative freedom and virgin territory, with plenty of unique touches like the blue street signs on Beirut buildings. 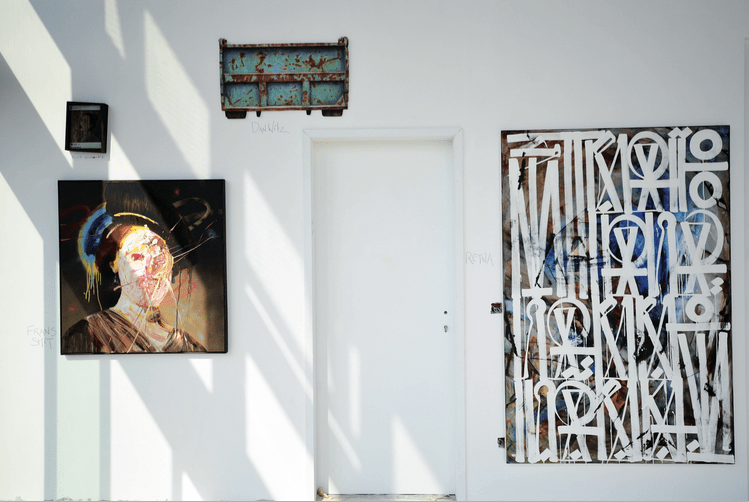 He and other Lebanese artists sometimes also travel to various cities to pick up local styles and leave their mark on foreign lands. There’s a wide variety of street artists in Lebanon today, partly because the term encompasses quite a lot of artforms and a series of recent events and initiatives suggest our urban culture is blooming in new ways. In an effort to disrupt Beirut’s monotony, the popular Dihzahyners group has injected a much-needed pop of color to large inner-city stairways in the city. Similarly, The Chain Effect organization uses bike stencils, bright colors and inspirational quotes to encourage Beirut’s cycling culture. In fact, many of these Lebanese artists live off their craft. They are often commissioned to work in Lebanon and around the world, in private residences, restaurants and clubs, for events or other initiatives. Today, the Ashekman twins are still musicians and street artists, adding to that a design studio and their own line of streetwear and merchandise. EpS is a full time artist but also likes to take it to the streets, sometimes partnering with other local celebrities like Exist, Fish and Maalim. Great read, thanks for sharing Olga!